Posted by National Admin on 03/01/2019. 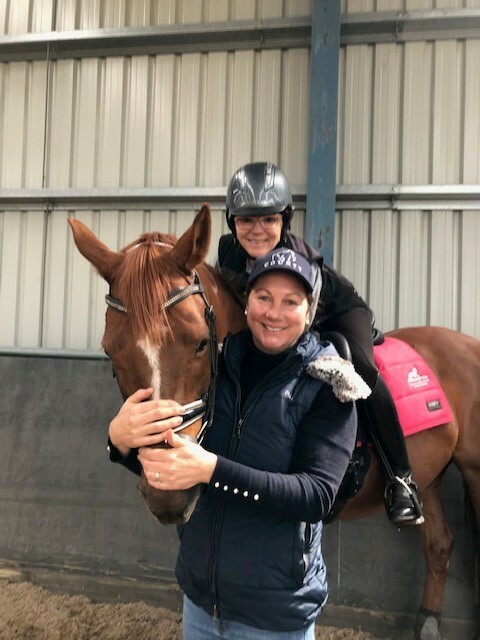 Lydia Jackson is an EA Level 2 General Coach, an EA Level 3 Dressage Coach and a Coach Educator (CE) based in Kingston, Tasmania. "I was very small when I started to ride. I initially did Pony Club and Showing then moved to Show Jumping and Eventing. My parents both rode. My mum got my dad riding once they were married. Dad rode to Advanced Eventing and competed at the Australian Championships. Mum rode and produced horses to Small Tour Dressage and competed Grand Prix. Nowadays, I am 43, married to Jonathan and we have three children - Harry (10), Sabrina (9) and Charlie (6). I am a full-time coach, train dressage horses and run a successful agistment centre called Kingston Agistment, based in Tasmania. I have two competition horses. The first is Malteaser R, who is competing Advanced dressage and not far from a PSG start. He was purchased from Heath Ryan. I also have Real Peachez who is competing at Novice. I have a lovely 2-year-old, also purchased from Heath Ryan, that I am excited about. I love my job as an EA Coach. I love the thrill of training and working with both riders and horses towards fulfilling their dreams. I think my passion is my quality. A career highlight has been the sale of 'Thumberlina', a mare that we recently sold to the King of Thailand. She was bred and produced by my mum and me. Looking forward to the future, I would like to take one of my horses to Germany and train and compete."